All airflow management strategies strive to either maximize cooling by supplying cooling (“supply”) air directly to equipment, or by eliminating the mixing and recirculation of hot equipment exhaust air. Sound airflow management strategies are becoming even more important as data centers accommodate modern high–density server racks, which demand 20 kW to 30 kW of power per rack versus 2 kW per rack just a few years ago—and generate ten or more times the amount of heat per square foot. Diffusers should be positioned to deliver cool air directly to the IT equipment. At a minimum, diffusers should not be placed such that they direct air at rack or equipment heat exhausts. 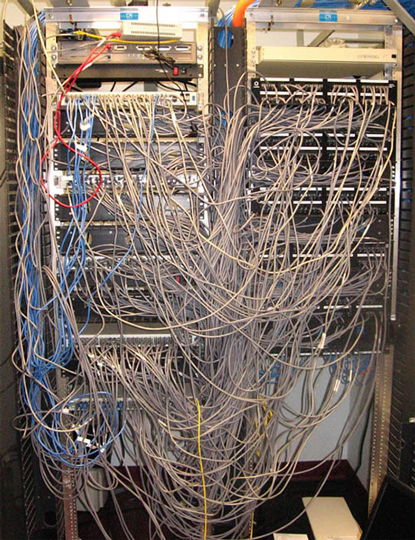 Blanking panels are fundamental to efficient airflow control in server racks. On the front of server racks, unused rack spaces (open areas) are covered with blanking plates so that air passes through the equipment rather than around it. 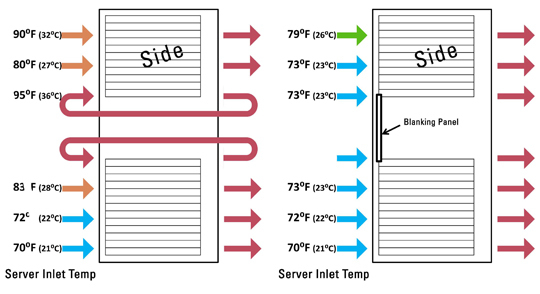 Blanking panels decrease server inlet air temperatures as well as increase the temperature of air returning to the CRAC, both of which improve operational efficiency. (See Figure 7 and 8 below.) 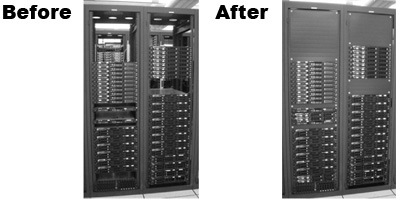 BNY Mellon, an ENERGY STAR certified data center, employed blanking panels as part of their energy efficiency upgrades. Eliminating sub–floor obstructions can improve efficiency. 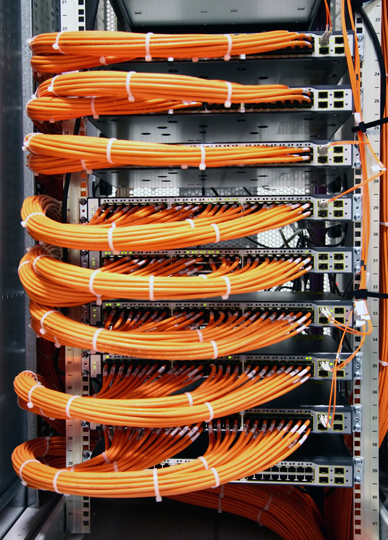 Many data centers use the sub–floor plenum for more than just airflow. Cabling, for instance, can impede proper air circulation, and taking fixed obstructions into account can yield a more efficient floor tile arrangement. Floor grommets (see Figure 11) improve cooling efficiency by sealing areas where cables enter and exit plenums (such as a raised floor). Less leakage helps direct more cold air to the equipment that needs cooling. Vented tiles are incorrectly located or sized in many data centers. Due to the complexity of airflow behavior, the correct configurations are not readily obvious. A professional air flow assessment can help indentify ways to improve cooling efficiency. Staff at Kaiser Permanente’s ENERGY STAR certified data center used boat covers, underfloor baffles and blanking panels to eliminate nearly 70,000 CFM of bypass air. See their case study (PDF, 79 KB) and public service announcement (PDF, 2 KB) recognizing them as a Low Carbon IT Champion. Floor grommets cost roughly $50 to $100 each, depending on the size and function. The Green Grid recently completed a comprehensive analysis (PDF, 2 KB) of return on investment and power usage effectiveness for data center efficiency upgrades. Payback for adding baffles and blanking panels, repositioning temperature/humidity sensors, and adjusting temperature setpoints was 29 months on capital costs alone. Google’s Green Data Centers: Network POP Case Study (PDF, 4 KB) examines a small data center’s efforts at efficiency with optimized air vent tiles, temperature and humidity adjustments, cold aisle containment, and CRAC air return extensions that had an ROI of less than one year. QTS undertook a variety of measures to save energy at its Atlanta Metro data center. One critical initiative was to optimize airflow, which was no small task considering the facility is one of the largest data centers in the world. At 990,000 square feet, it serves more than 200 enterprise customers and has its own on–site electrical substation. Ensured that open vented tiles were not obstructed by unused equipment, plastic bins, and cables. Closed vented tiles that were not in use. 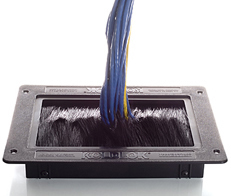 Installed self–sealing grommets with brush material in the raised floor to seal holes for cables and wiring. Used vinyl covers to seal gaps around entrance doors, pipes and windows to keep cold air from escaping, or hot air from entering, the raised floor. The results speak for themselves. After implementing these measures, QTS’s PUE (power usage effectiveness) dropped by 0.11, resulting in a savings of approximately $60,000 over a two–month period. These measures made up approximately 20 percent of the company’s energy efficiency savings. Additional power management efforts included economizers, efficient lighting and work on chiller temperatures. The multiple initiatives undertaken by QTS earned the Atlanta metro facility a Leadership in Energy and Environmental Design (LEED) Gold certification. Location and size of vented tiles (e.g., not located in the hot aisle). 24 Data Center Energy Efficiency Best–Practices — Insights Into The ROI On Best–Practices, December 3, 2008, 42U. 25 The vertical space taken up by a server is measured in Rack Units (RU or "U"). A ’U’ is equivalent to 1.75 inches (4.45cm).